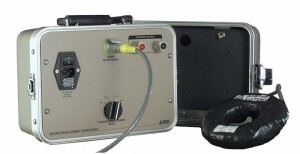 The Arbiter Systems®, Inc. Model 936A Reference Current Transformer provides laboratory grade accuracy in a small, portable, ruggedized case, making it ideal for field use. Multiple ratios of 1200:5, 1000:5, 800:5, 600:5 are selectable via a front panel switch. The guaranteed accuracy over the full input range and operating conditions is 0.02 % ratio and 0.01 ° phase (traceable to NIST), ideal for calibrating other current transformers. The Model 936A uses an active transformer to achieve the high accuracy needed for a primary reference. This design incorporates a dual core toroid with an amplifier aided second stage. The active circuitry reduces the sense transformer core flux to zero and produces an accurate output current independent of burden. The Model 936A was designed primarily for use with the Model 935A Current Source and the Model 931A Power System Analyzer to calibrate current transformers used with the Model 1133A Power Sentinel. The Model 936A’s multiple ratio selections allow other current transformers to be tested and calibrated across their entire operating range. Inlet IEC-320 with fuse and mating cordset. Specify P01 – P10.